More than half of takeaways questioned in a survey said they would use an alternative if they could, but the sample size was pretty small. Disruptive companies are always going to have their naysayers. However, if they include some of your customers, you may have a problem. Two thirds of takeaways using Just Eat think the mobile ordering platform’s fees are unfair, according to a survey of 405 restaurants commissioned by Preoday, a free app builder. Meanwhile, 53% ‘are looking to leave’ if they find an alternative (whether they would actually jump ship is another question). The takeaways surveyed paid an average of £725 per month in fees, based on a minimum order commission of 10%, and those paying more were, unsurprisingly, more peeved: 81% of restaurants spending between £1,001 and £2,000 a month with Just Eat thought the fees were unfair. Meanwhile, 52% said they had lost ‘significant revenue’ from loyal customers using the service to order. However, some caveats are in order (see what we did there?). 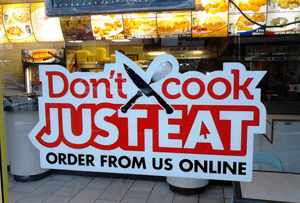 Firstly, the study’s sample size was relatively small: around 5% of the 20,000+ takeaways that use Just Eat in the UK. Secondly, Preoday, which paid for the study, timed it to coincide with the launch of its free takeaway app builder (restaurants can pay for premium versions), making the study’s results rather convenient. Neither caveat necessarily means the findings aren’t indicative of a wider feeling among takeaways using Just Eat, but they are worth bearing in mind. Just Eat, which is now trading almost 17% below its listing price after floating in April, declined to comment. A spokesperson did, however, point out that takeaways see average order value increase by 30% when it signs up to Just Eat (although that’s a group-wide figure – the company operates in 13 countries). Is Jeff Bezos the saviour of the British high street?